SUTHERLAND SPRINGS, TEXAS (REUTERS) – A gunman massacred at least 26 worshipers and wounded 20 others at a white-steepled church in south-east Texas on Sunday (Nov 5), carrying out the latest in a series of mass shootings that have plagued the United States, the authorities said. The lone suspect, wearing black tactical gear and a ballistic vest and carrying an assault rifle, opened fire after entering the First Baptist Church in Sutherland Springs in Wilson County, about 65km east of San Antonio. The victims ranged in age from five to 72 years old, law enforcement officials said at a news conference. It was not immediately clear if the suspect killed himself or he was hit by gunfire by the resident, the authorities said. “We are dealing with the largest mass shooting in our state’s history,” Texas Governor Greg Abbott said at the news conference. “The tragedy of course is worsened by the fact that it occurred in a church, a place of worship where these people were innocently gunned down.” Neither the suspect’s identity nor motive were disclosed by the authorities. But law enforcement officials who were not identified have said the gunman was Devin P. Kelley, described as a white, 26-year-old man, the New York Times and other media reported. The massacre comes just weeks after a sniper killed 58 people at an outdoor concert in Las Vegas, the deadliest mass shooting in modern US history. The shootings have stirred a years-long national debate over whether easy access to firearms was contributing to the trend. “We have a lot of mental health problems in our country, as do other countries. But this isn’t a guns situation,” he said. “Fortunately somebody else had a gun that was shooting in the opposite direction. He added federal authorities would help Texas in the aftermath of the shooting and that all of America was praying to God. According to the witnesses, about 20 shots rang out at 11.30am (1.30am Singapore on Monday) during the church services, according to media reports. It was unclear how many worshippers were inside at the time. Connally Memorial Medical Centre in Floresville received eight patients, the hospital said in a statement, while Brooke Army Medical Centre at Fort Sam Houston received another eight. 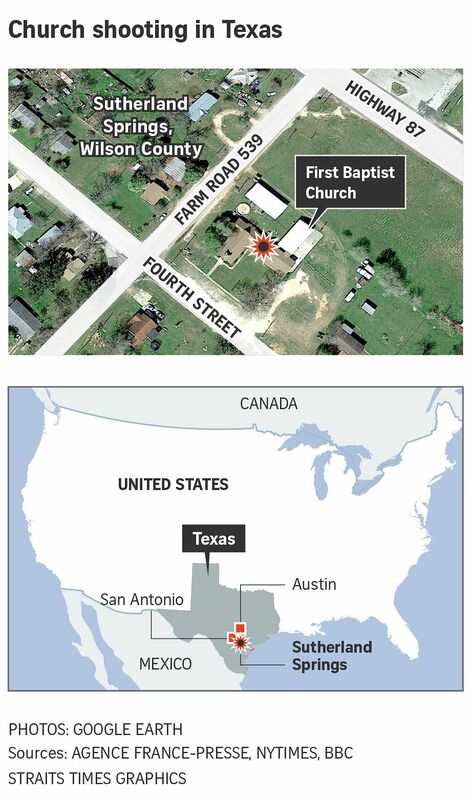 The First Baptist Church is one of two houses of worship in Sutherland Springs, an area that is home to fewer than 900 residents, according the 2010 Census. There are also two gas stations and a Dollar General store in town. The white-painted, one-story structure features a small steeple and a single front door. On Sunday, the Lone Star flag of Texas was flying alongside the US flag and a third, unidentified banner. Inside there is a small raised platform on which members sang worship songs to guitar music and the pastor delivered a weekly sermon, according to videos posted on YouTube. In one of the clips, a few dozen people, including young children, can be seen sitting in the wooden pews. The shooting occurred on the eighth anniversary of the Nov 5, 2009, massacre of 13 people at the Fort Hood Army base in central Texas. A US Army Medical Corps psychiatrist convicted of the killings is now awaiting execution.